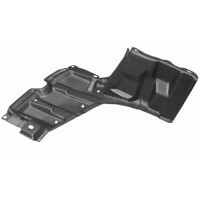 Engine Protection lower plastic, does not include soundproofing. Product of competition (aftermarket), of equal quality to the original and homologated. For mounting it is always advisable to consult a qualified staff. N.B. The image of the insertion is indicative of the product sold. In the case both provided the choice of the right side (passenger side) or left (driver's side, refer to what is written in the description.